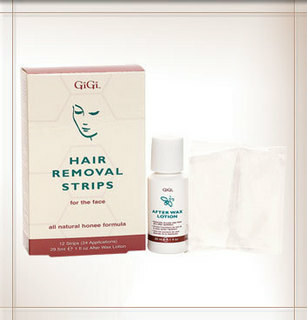 GiGi Hair Removal Strips for the Face are perfectly sized for the upper lip, eyebrow, chin and hairline. The pre-waxed strips, formulated with All Natural GiGi Honee, lift away unwanted hair, leaving the skin soft and smooth for weeks. GiGi After Wax Lotion moisturizes the skin, removes excess Honee and refines pores.